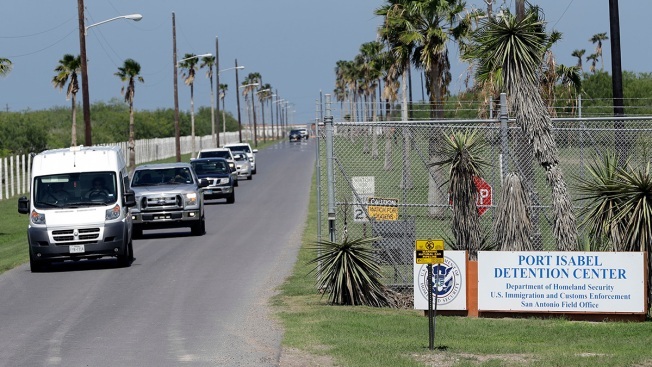 FILE - In this June 26, 2018, file photo, vehicles leave the Port Isabel Detention Center, which holds detainees of the U.S. Immigration and Customs Enforcement, in Los Fresnos, Texas. Immigration officials say a 24-year-old woman delivered a stillborn baby while in custody last week. They say the Honduran woman was about six months pregnant when she went into premature labor and delivered a stillborn boy on Feb.22, 2019, after having been hospitalized but cleared for release a day earlier. A 24-year-old Honduran woman went into premature labor and delivered a stillborn baby at an immigration detention center in Texas Friday, NBC News reported. The woman was about six months pregnant when she was apprehended by Border Patrol near Hidalgo, Texas, on Feb. 18, according to a joint statement by Immigration and Customs Enforcement and Customs and Border Protection. The agencies said the woman was taken to a hospital and cleared for release on Thursday after receiving two medical screenings. She was transferred to ICE custody at the Port Isabel Detention Center to be processed for release Friday afternoon, the statement said. But later that night, the woman "began complaining of abdominal discomfort" and EMS was called.